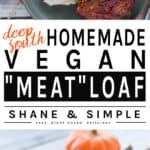 Deep South Homemade Vegan Meatloaf. Savory, hearty and extremely comforting. It goes perfect with my Homemade Vegan Creamed Corn and Creamy Homemade Vegan Mashed Potatoes. Seems like everybody’s buying pumpkin candles or cinnamon brooms to make their house smell like Fall. Forget all that! 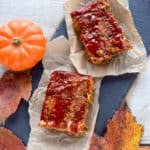 If you make this Deep South Homemade Vegan Meatloaf, I guarantee your house will smell like Fall on steroids. And, unlike those candles and brooms, you can eat this. OK, I’m going to make this short and sweet because I’m pretty sure you wanna be eatin’, not readin’. Yeah, I know there are a ton of “meatless”, lentil, oat, chickpea, whatever loafs out there. So, what makes mine so special? Honestly, not much. 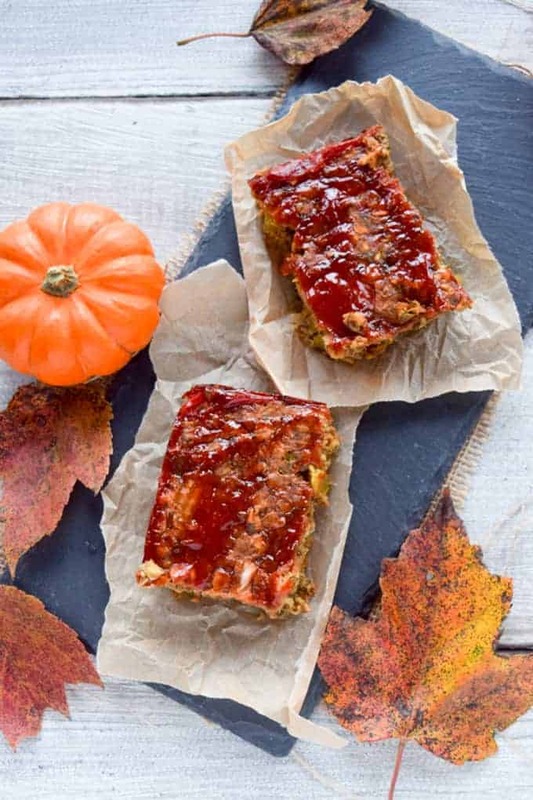 But, it’s easy, normal, and delicious just like a regular meatloaf. Which is exactly why everyone who tries it will think you’re awesome. Remember, I don’t use ingredients you can’t pronounce. And, I don’t use things that are only grown by some goat herder in Albania on the shores of the Adriatic Sea. It’s Shane…and Simple. I use lentils for the meat replacement because that’s what I like and they’re awesome. You’re more than welcome to try something else. But, why would you do that? I’ve done all the heavy lifting for you. Seriously, chill. 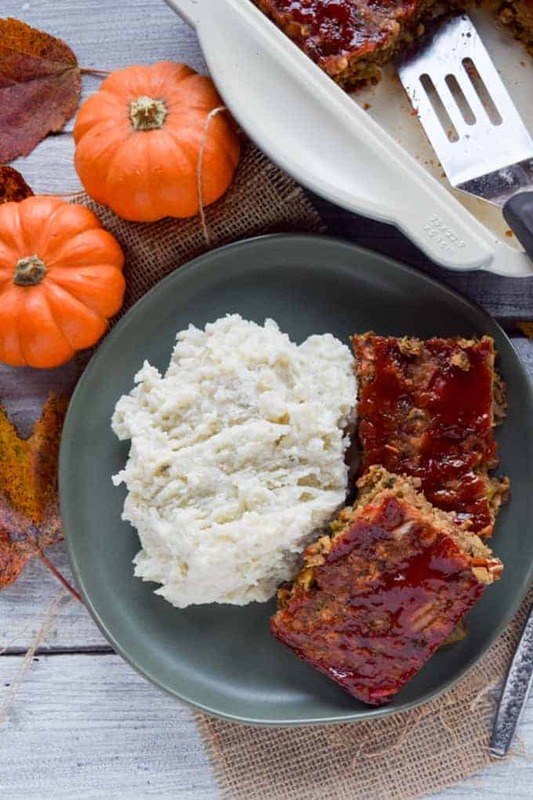 Other than lentils and oats, it’s standard meatloaf ingredients, except for one little thing – NO MEAT! And, that means no heart disease or diabetes. Winner! That also means you could eat this stuff raw if you wanted and it wouldn’t kill you, so get your hands in there and mix it real good! FYI, I still prefer mine cooked. But, hey, that’s just me. Now, all that’s left is to throw it in a baking dish, smother the top with ketchup (that’s how us rednecks do it), and let it cook at 350 degrees for about 45 minutes. Use your free time preparing to devour this bad boy; dream about the sandwiches you can make with the left-overs; or, relax and think about the praise you’ll receive for creating such a fine, delicious, and healthy meal. And, worthy of any praise you shall receive. Hey, if you make this and not feeling too full and sleepy after you’ve eaten, I sure would appreciate you leaving a comment. Then, go ahead and take a picture; then post it on Instagram; and, then tag the photo #shaneandsimple because I want to see your creation. Gracias! Deep south homemade vegan meatloaf made with lentils and oats. Super satisfying, savory, meaty, hearty and easy to make. It’s nothing like mom’s…it’s better! Ouch. Combine all dry ingredients into mixing bowl and whisk together. But, don’t worry. Even if you don’t, it will still turn out just fine. 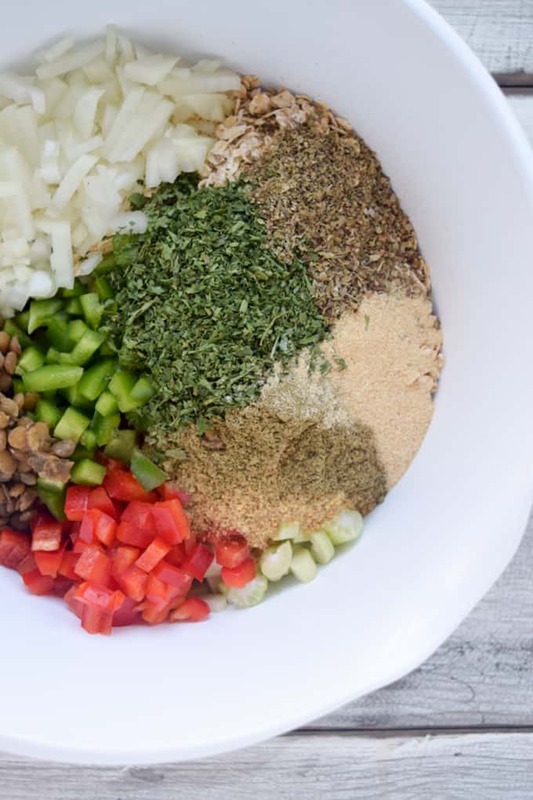 Add remaining ingredients to the bowl and mix together well. You don’t want to completely mash the lentils, but you do want a somewhat “mushy” consistency. If the mixture seems a little dry, add water or veggie broth for a little more moisture. Lightly spray a baking dish or use one that is non-stick. Spread a thin layer of ketchup in the bottom of baking dish. Because I like my stuff coated withe ketchup on both sides. 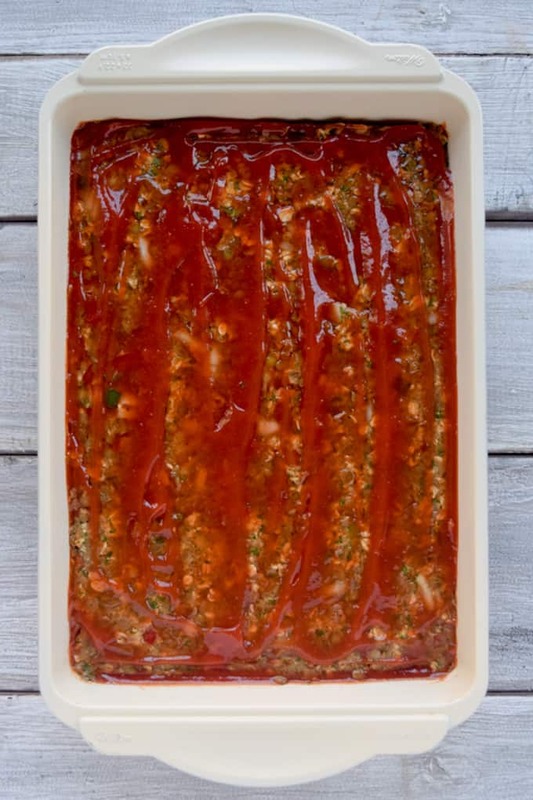 Pour mixture into baking dish and add a layer of ketchup on top of meatloaf. Remove and let sit for 10-15 minutes before serving. Would this work well to cut and freeze in slices? I am the only WFPB eater in my household and I don’t think I could or would want to take take down a whole loaf in one sitting.? Thanks for the recipe. It sounds delicious and the pictures are amazing. Can’t wait to cook this up! LOL! You can do it:) But, seriously…yes, it freezes well in our experience. Thanks for the feedback. I hope you enjoy it! I really don’t like flax…think this recipe would be ok without it? Yes, you can try equal amounts of chia or just try without it. This has become a regular menu item in our house. Thanks for creating, testing and sharing the good stuff. Michelle, this makes me smile. It’s my pleasure. And, glad you enjoy it! Thanks for letting me know. I think I goofed this on a couple of steps. All of my veggies ended up being about 1 1/2 cups each. The mixture ended up being on the wetter side, but not mushy, should I have mashed some of the lentils first? I also baked it in a loaf pan, it just barely fit. It wasn’t until after I cut up the loaf and attempted to plate it that I thought about your picture. Did you use a 9×13? The flavor is definitely there! Lastly, I just wanted to confirm, that’s 1/2 CUP of dried parsley? I’ve just never had a recipe call for that much before so I got a little nervous and didn’t put that much in. Thank you for your “no bs” recipes. It can be hard finding good recipes without having to go get some random ingredients that you’ll probably never use again. Lisa, be sure the lentils are cooked really well. I don’t “mash” them, but they do get mushed a little during the mixing process. Yes, I do 1/2 cup of dried parsley and though the picture shows it in a 9×13, I will bake in a loaf pan sometimes. But, I think it cooks better in a 9×13. I am glad it tasted good:) Try again and let me know how it turns out. Thanks for the response. Blessings. In step 3, is there anything I an use other than my veggie brother? Seems kind of cruel! Lol. OMG! That’s hilarious. I hate auto-correct:) Thanks so much for pointing that out, but it is pretty funny. LOL! So glad you enjoyed the recipe, Nancy. Peace. Rocked his newly vegan world. This is a keeper. Will use it to impress dinner guests. Melissa, excited you are going to make this. Yes, just leave the peppers out. It’ll do just fine:) And, you are most welcome for the recipes. Thanks for reaching out! Enjoy the “meat”loaf:) Peace and feast. This recipe looks so delicious. I am going to make it very soon, only would like to know how much dried lentils to cook to make the 3 cups of them, please? One cup of dry will give you 2 1/2 cooked. I will use 2 cups dry and make extra so I have leftover lentils for lunch, etc. 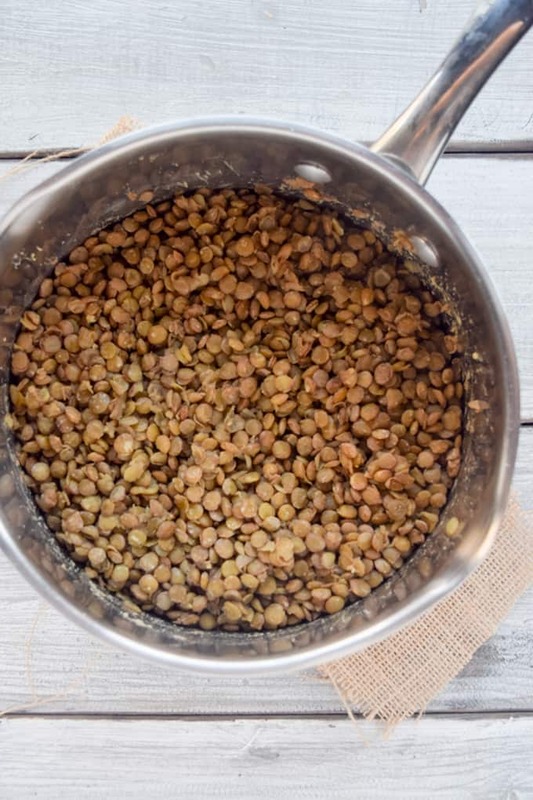 When you use 2 cups dry lentils, how much water are you using? The recipe calls for 3 cups of “cooked” lentils. But, when cooking, it’s 3 cups of water per 1 cup of lentils. So, for two cups of dry lentils you would use 6 cups of water. Question: Does the 1/2 cup of ketchup go in the mixture or is that for the top and bottom? I used a glass loaf pan. My loaf was a very mushy even after cooking an extra 3O minutes. Any suggestions? BTW it still tastes delish! Spread 1/4 cup on bottom and add remainder to meatloaf. 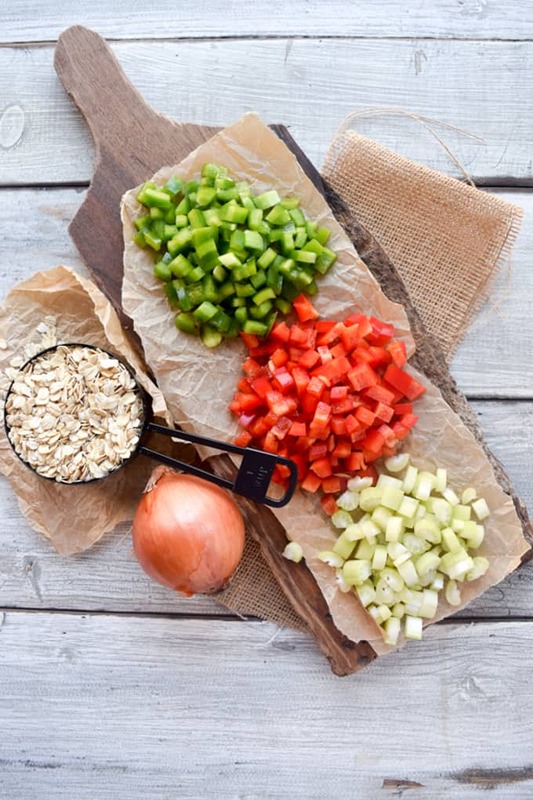 You can also add 1/2 cup extra oats as well. Tasted great. However wanted a loaf that sliced like meatloaf does. I used a loaf pan. Had I used a rectangular pan still would not have been firm. Amy, thanks for responding. I went back and checked the recipe because mine doesn’t ever come out “mushy.” There was a typo with the oats. It should 2 cups of oats. That should help and letting sit for 10-15 mins. before serving allows it to firm up too. Hope this helps. Thanks Shane. Might give it another go then. Delicious! Thank you for our new favorite “meatloaf”. Made exactly as described except for the marjoram (didn’t have any) and the sage (don’t like that flavor for meatloaf). Baked in a 9X13” pan. Nice crust and still moist/chewy inside. Omni approved by my (still) meat lover husband. Thank you, Adrienne! So good to hear and pumped everyone enjoyed it. I really appreciate you sharing with me. Stay on him and eventually he’ll come around. Stay the course:) Blessings! What type of lentils do you use? The photos look like they are brown. Would any kind work? Red, green, brown? Appreciate your recipes and site. Thanksgiving here we come!!! I like brown or green just because they are bigger and more meaty. Red and yellow tend to be much too soft for a loaf. This recipe is so good! I found an awesome use for leftovers, too. 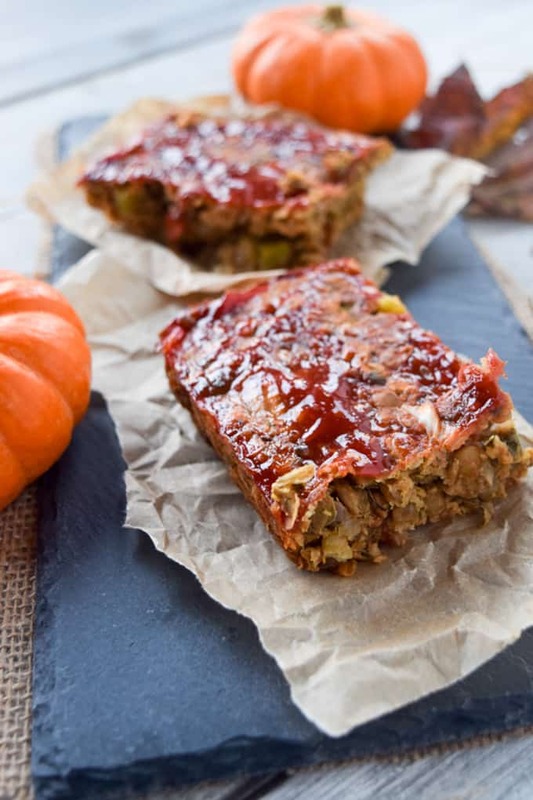 Crumble the meatloaf up into large chunks and bake on a silpat at 400 for 15 or so minutes. Then serve it over pasta and sauce to make a lentil bolognese. It’s delicious! Now I need to try your baked onion rings! Wow! That’s sounds amazing!!! Thanks so much for sharing and so glad you enjoyed it. Hello! I made this last night, and I really loved this recipe. I’m not a huge ketchup fan, so I added barbeque sauce to half of my loaf and both halves were amazing! Even the half with the ketchup. 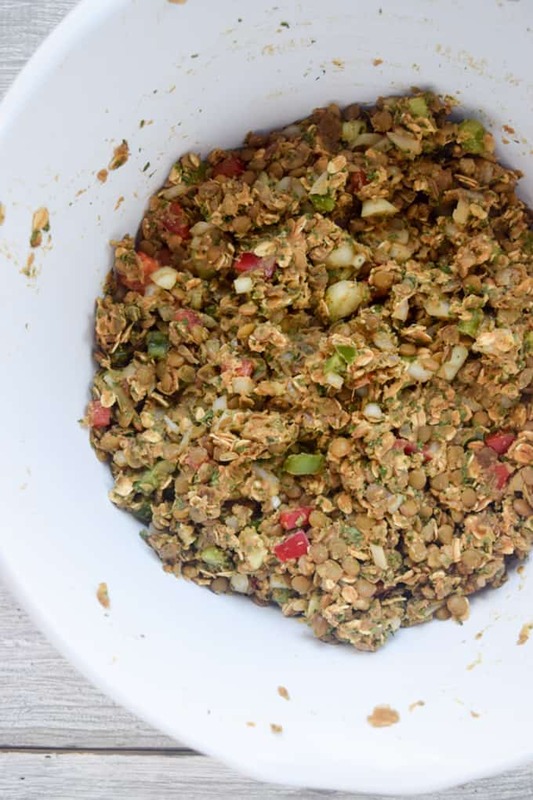 Thank you for sharing this recipe – I look forward to trying more from you. Julie, that’s so awesome. And, I love the idea of adding BBQ sauce. Way to make it work for you. So glad you all enjoyed it and thanks so much for reaching out! Hi, I am planning to make this meatloaf recipe tomorrow. Can I use canned lentils? Yes! Be sure to rinse and drain. I used TVP in place of the lentils and nutritional yeast. Everything else was the same. It smelled like real meatloaf when it was cooking. It was marvelous and tasty. Your mix of spices and green peppers made the difference. Can’t get my husband to make the switch yet. I have the meatloaf and he has the roast. I love meatloaf night. oh so good. That sounds great, Rene. Love your alterations. Cooking is all about exploring and adapting. Thanks so much for the kind words and hope you have a great Christmas!!! This was amazing, hands down best veggie meatloaf. I have come across. Thanks. I have everything bar the flax or chia seeds. What do I do? I do want to make this for Valentine’s Day. Thanks. You can replace the flax with an equal amount of whole wheat flour. Hope this helps. A staple in our house – so yummy, and I freeze leftovers to use in a time crunch during the week at a later time. I thought this was really good. Next time I would just smash it down more in the pan so it doesn’t crumble when I am cutting it. Flavor is great!